It’s long been a tradition in my family that come Christmastime, my parents have family and friends over for a traditional German meal. 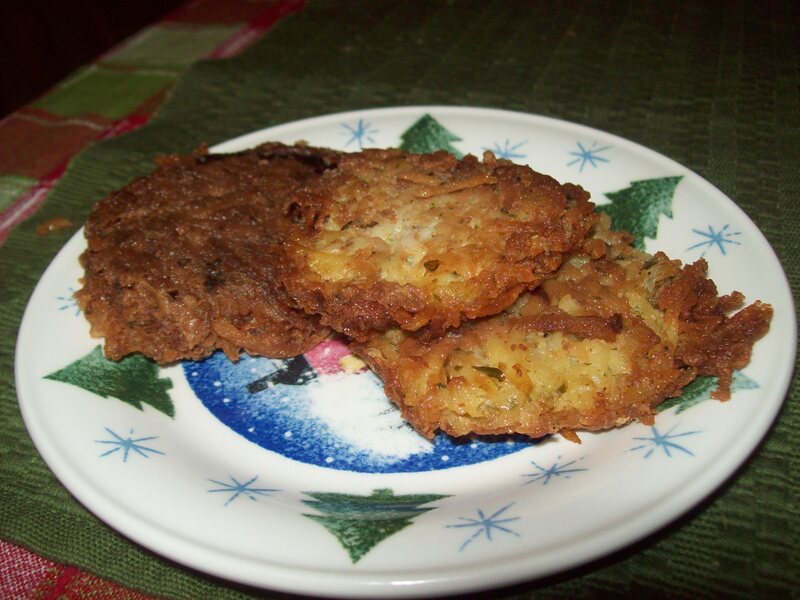 One thing that always confused me however was the addition of homemade potato pancakes, also known as latkes. Generally most people associate them with Hannukah and Jewish people. Not for nothin’, but we’re all Christian in my family, so I never really got the connection. Fast-forward to me being an adult and having a more worldly view of, well, the world; I discovered that potato pancakes actually share a pretty wide open history, being eaten by lots of cultures. Specifically, Germany has a big history of eating potato pancakes. Suddenly, everything made sense to me. And by everything, I mean the fact my parents were serving them at a German meal. No matter whether you’re Jewish or German or whatever, latkes are delicious. Spoilers: They’re also incredibly easy to make. Peel both the onion and potatoes, and then using a cheese grater, vegetable grater, or food processor, shred both of them so that they resemble shredded cheese. Using paper towels, squeeze excess water out of the potato and onion to dry it off somewhat. Beat eggs in a medium bowl until smooth. Stir in baking powder, flour, parsley, salt, and pepper. After the mixture is well-blended and batter-y, add the onion and potato in and stir until it’s combined. Griddle: This produces flatter, more crisp pancakes. In doing so they feature no oil and are marginally healthier for you if you’re trying to cut out extra calories! Griddle Instructions: Heat a stovetop griddle or frying pan over a medium flame, and spray with non-stick coating. Pour the batter in 3-4″ circles and cook several minutes until bottom is golden brown. Flip pancake and repeat with the other side until it is thoroughly cooked. Shallow/Deep Frying: This will create latkes that are fluffier and more moist. Obviously they’re a little higher on the fat side due to the oil, but if you use canola or other healthy oils it shouldn’t be a big deal. Shallow Frying Instructions: In a medium frying pan pour oil to a depth of about 3/4″ and heat until oil is ready. Load the pancakes into the oil as 4″ circles with a large spoon and fry until golden brown around edges. Flip over with a fork and fry until they are tan on both sides. Remove and drain well in paper towels. No matter which method you use, they come out perfect and simple. They’re great on their own or can be eaten with apple sauce, sour cream, or ketchup. Enjoy them at Hannukah, Thanksgiving, Easter, who the hell cares. Just enjoy ’em. If frying them in oil, make sure to drain them very well after removing from the oil. Blot them with paper towels on both sides, since they can get very greasy if left alone, as you can see in the pic above. Delicious? Yes, still. But greasy foods don’t always agree with your stomach. If you’re feeling adventurous add in 1 tbsp of shredded cheddar cheese to the batter. It adds some nice cheesy goodness. Like real pancakes, these can have their size adjusted depending on the scenario. If you’re cooking for a small group, you can make a few really big ones, or spoon them out as little silver-dollar pancakes. Posted on December 19, 2014, in Etcetera and tagged easy, pancakes, potatoes, recipes, vegetarian. Bookmark the permalink. 2 Comments.